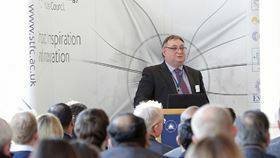 LPW Technology’s technical director Andy Florentine, delivered a presentation at Daresbury Laboratory, Cheshire, UK. LPW Technology’s technical director Andy Florentine, delivered a presentation at Daresbury Laboratory, Cheshire, UK, on 29 November. Florentine’s talk, entitled 'Metal 3D printing – the pow(d)er and potential,’ focused on the possibilities of the fast-growing technology, discussing the benefit of creating components by additive manufacturing (AM), and stressing the importance of selecting the correct metal powder and controlling the process. Daresbury Laboratory is the location of LPW’s R&D facility and is part of the Science and Technology Facilities Council, a UK government facility dedicated to scientific research in fields such as accelerator science, physics, chemistry, materials, engineering and computational science. Here, LPW’s R&D team is focusing on ways to control and track the condition of metal powder in the AM process.